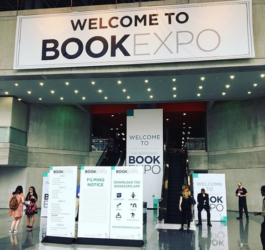 BookExpo America is the country’s largest ​book fair, held this year in NYC’s Javits Center. Publishing professionals, librarians, booksellers, ​and authors​ all gather under one giant roof to meet with colleagues, see ​publishers’ ​upcoming books, ​sell foreign rights, meet with media, ​and (best of all) ​meet the writers and editors who are shaping the industry.​ As always, the Javits Center was ​the place to be with books and the people who love and create them—such a fun scene, especially since ​for a first-time attendee​ like me​. The event offers a variety of educational panels, ​high energy booths with displays of books, ​and ​long lines for book signings snaked through the aisles. ​We loved ​the​ chance to connect with colleagues and ​feel the amazing energy​. ​Itreally is astonishing to see the huge number and variety of books that are ready to enter the world and find their readers! Please send me information on upcoming conferences. Hi Emily! Please see the new “Events” tab on our website!